A meteor shower is a natural phenomenon characterized by the observation of a greater number of meteors than usual that all appear to originate from approximately the same celestial coordinates during the same dates each year. Meteor showers are caused by Earth colliding with space debris left in the wake of a comet or asteroid. For example, Halley's Comet is associated with two meteor showers, the Eta Aquarids and the Orionids. However some meteor showers seem to have no parent body. It is theorized that such showers are caused by the remnants of comets or asteroids that have completely disintegrated or have changed orbit and are no longer present when Earth passes through its debris. Until the Leonid meteor storm in 1833 many scientists thought meteors were a terrestrial weather related phenomenon and did not accept that meteors were extraterrestrial in origin. It usually takes at least several hours to determine that a meteor shower is in progress because at the onset of a shower the number of meteors seen is usually very few. It becomes apparent that a meteor shower is happening when over time, nearly all meteors seem to come from the same point in the sky, called the radiant. 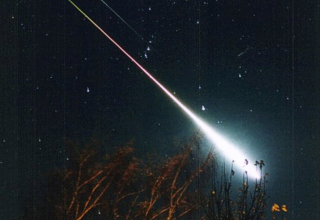 The radiant slowly changes position in the sky during the course of a meteor shower, but remains in the vicinity of it associated constellation. Meteor shower names often include the name of the constellation from which the shower seems to originate during its peak time. There are over 120 recognized meteor showers each year and from these a number of meteors do not entirely disintegrate, falling to Earth as dust or micrometeorites. An interesting way to count meteors during a meteor shower is to listen for them on a radio. By tuning a receiver to a radio station that is normally too far away to detect, a listener can hear bursts of reception caused by radio waves reflecting off electrons in the wake of a meteor. With this method receivers over a thousand miles from a transmitting station can be detected and meteors can be counted even if seeing conditions are poor. Scientists use specialized equipment including RADAR and computers to automate this type of detection and analysis. The study of meteors and meteor showers provides information about the origins of comets and asteroids plus clues about the distribution of matter in the solar system.